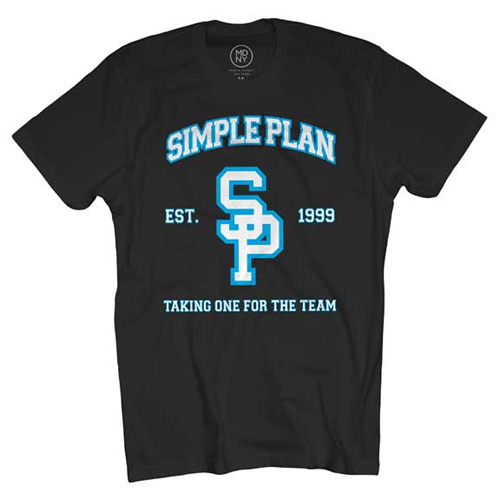 The Montreal-based punk-pop group Simple Plan is comprised of high school pals Pierre Bouvier (vocals), Jeff Stinco (guitar), David Desrosiers (bass), Sebastien Lefebvre (guitar), and Chuck Comeau (drums). The five-piece initially came together when Comeau and Bouvier founded Reset at age 13. Reset was a modest success in Canada, touring the country with fellow punkers MxPx, Ten Foot Pole, and Face to Face. A debut album followed in 1997; however, Comeau bowed out quietly to attend college. Two years later, Comeau let his studies take a back seat in order for he, Stinco, and Lefebvre to start making music. At the same time, Bouvier was still in charge of Reset, but growing tired of being both a frontman and a guitarist. He and Comeau reconnected at a Sugar Ray show in late 1999 and soon Bouvier was back with Comeau and the rest of his motley crew. Desrosiers, who replaced Bouvier in Reset, was asked to join Comeau and his pals, and Simple Plan was born. They landed show dates with the annual Vans Warped Tour in 2001 as well as spots with Toronto's Snow Jam. By now, Simple Plan had a spunky, energetic punk sound, textured like Cheap Trick, but raw like Pennywise. In 2002, Simple Plan headed into the studio to make a record. Good Charlotte's Joel Madden and Mark Hoppus of blink-182 joined Simple Plan during those sessions and the end result was the fiery, fun No Pads, No Helmets...Just Balls, which was released in spring 2003 on Lava. The group took home a 2003 MuchMusic Video Award for People's Choice Favorite Canadian Group in June. Their Bob Rock-produced second album, Still Not Getting Any..., followed the next year and did quite well, scoring the hits "Crazy" and "Welcome to My Life." In 2005 Simple Plan issued Live from the Hard Rock. The following year, the band scaled back their touring schedule in order to concentrate on writing new material. Simple Plan entered the studio in June 2007 to begin work on their third studio album; the self-titled Simple Plan was released in February 2008.